Review: Makeshift – ‘Morale’ EP – Ouch That Hertz! The Merriam-Webster Dictionary defines a makeshift object as that of which is a usually “crude and temporary expedient.” A makeshift item is your last-ditch effort; it’s your last resort- your final option. It’s the inferior substitute that you hastily pick up or fall back on because you don’t have any other choice, be it the rigging of your tailpipe to your undercarriage, the emergency soldering on your bass’s fragmenting interior cabling, or deploying the “less-mangled” cables because you didn’t realize that your ¼” TRS heads should’ve been replaced a while back and it’s 30 mins before you go on but your house is 15 mins away, so you don’t have enough time to run back, and your bandmates are disappointed and your guitarist is screaming and your screaming and you should’ve just laid down in that puddle out the bACKDOOR ALLEY AND JUST INHALED THE WATER FOR A LITTLE WHILE. … Ahem. Sorry. I mean, uh, I’ve definitely never been in those situations before. Ever. The point is that, no matter how far ahead we think we’ve planned and prepared for, we sometimes inevitably end up fumbling along the way, calling to need the deployment of an “in-case-of-emergency” stopgap. Thus, we scramble, trying to adopt anything that can be a quick fix, a temporary replacement, or a jerry-rigged, improvised solution. Often times these hastily obtained temporary expedients are rudimentary at best- unsophisticated in nature, primitive in design, but will work in a jiffy. However, the same cannot be said of Long Island, NY’s rising pop-punk outfit Makeshift. 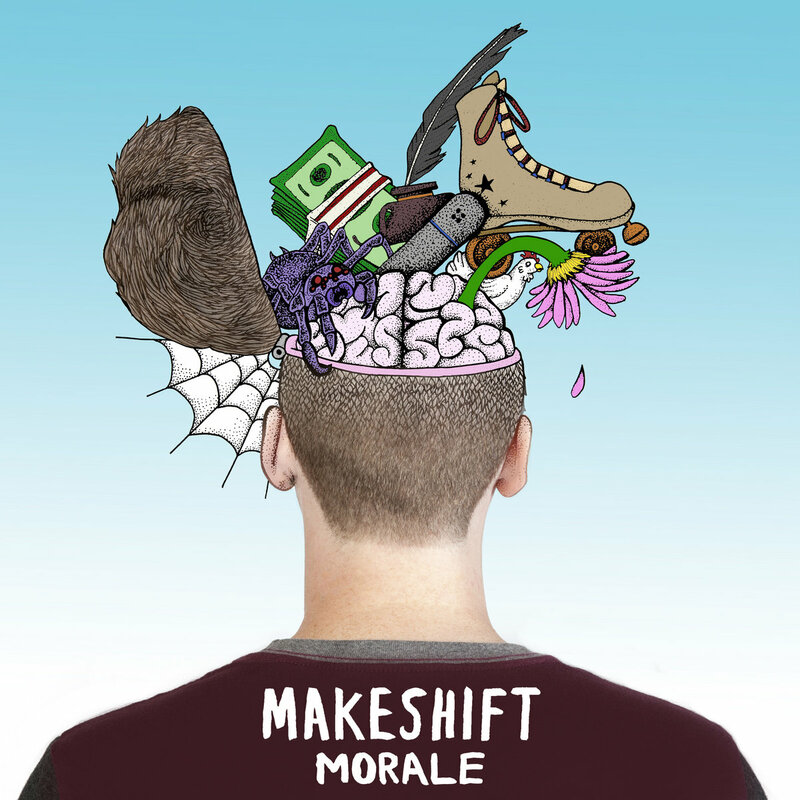 Their 2nd EP Morale, is anything but unsophisticated and sloppy as the band further capitalizes on sweeping, honesty-riddled melodies and clean- albeit slightly gritty- punk instrumentation that will be a long-standing affixment in your music library. If there’s one thing that Makeshift has an absolute penchant for, it’s their capacity for and proficiency in multi-layered melodic harmonics. Makeshifts members waste no time in delving into their fortified skillsets, heaping tirade after tirade of mellifluous theatrics throughout the duration of Morale. Guitarists Barrow and Musalo weave a vibrant web of instrumentals, entangling punchy, hardened riffs with layers of well-rounded melodious quick licks, deftly showcasing their craft and ability to produce bright, expansive punk instrumentations that burst and flourish in tracks such as “Damage,” “Inside Your Head,” and “Dover Road.” Percussionist Matt Mangione adds a further element of this sort of counter-emotional pep, delivering round after round of punctual, vigorous pop-punk dynamicism with every apt cymbal crash and snap of his snare. Bassist Dan Burke serves up a similar complimentary element of groove to Mangione’s percussive style, as his licks mirror that of a classic pop-punk style: short, simple, and direct. Though, I do wish that Burke would find a little bit more stylization within him instrumentation and musicality, as there’s more room to expand his deep, earthy grooves that shine so clearly in “Empty Shoes.” However, Makeshift isn’t entirely comprised of gritty distortion-filled riffage, as they take a moment to introduce the title track on the EP with a focus on Musalo’s voice and words, backed by the strums of an acoustic guitar before exploding into a dazzling, emotive display of their signature style of hardened riffage, driving home a sense of urgency and criticality within their larger message. Vocally, Makeshift manages to reach a higher level of emotional intensity while playing it safe and close to their respective range. Their process is nothing short of complicated, as fine-tuned stresses and meticulously-crafted enunciation accent marks drive home their message of introspective, blatant honesty. Between Musalo’s easily-relatable story-telling lyricism and Burke’s deft deployment of interspersed harmonies, the vocal output far-surpasses the all-too common, ear-grating, painfully strained bleating of their genre’s whinier contemporaries and colleagues. What further marks points of interest is how complimentary the instrumentation is to the vocals, as if the two were inevitably intertwined with each other, entangled in moments of pure, raw pop-punk bliss. That isn’t to say that Morale is not without fault, as two glaring- albeit, non-fatal- issues stands tall within this album. First and foremost is the track “On Leaving,” a spoken-word track which serves as more of an interlude and lead-in to the following track “Empty Shoes.” I’ll admit that I am definitely not appeased by sudden mid-album interludes, as they often tend to weigh down the flow of the album too heavily, creating an aural scramble to pick back up to speed for the remaining half of the album. While I understand the directionality and Makeshift’s intent of the track, it falls unbelievably flat in terms of its function and placement. The instrumentation is too forefront and the gain is far too high for the vocals, which divides both musical elements as if they were competing individual facets rather than a cohesive duo, which further pulls the full-speed Makeshift-train to a sputtering, grinding halt- a jarringly juxtaposed mishap from the pervasive groove-melody of “Inside Your Head.” The only thing that could have easily been rectified and, thusly, saved the placement of this track if “On Leaving” had a lead in from its predecessor “Inside Your Head-” and even then, the construction of those bridges would have to be immensely immersive and detailed. The other problem that arises from “On Leaving” is that it’s a waste of Burke’s vocal talent. These spoken words are a story- a poignant story which needs to be delivered with intense, heart-rendering emotion, lest the meaning is lost, the image painted is skewed, and the message loses its luster. The secondary issue that I take is that there is obvious dead space where more backing vocals, call-and-response, and harmonies could obviously fill the void. That isn’t to say that I wish for the entire album to be well saturated in these (or else Makeshift would end up sounding like their contemporary try-hards), but there are places for better execution and deployment of these nifty little aural tonalities that they could potentially greatly benefit from. Beer Pairing: Evil Twin Brewing’s Modern IPA: a frothy, medium-bodied IPA that emits aromas and flavors of bittersweet citric bursts. Understated hop flavors and grapefruit abound in this highly-carbonated, yet oddly smooth gold-colored IPA- a true testament that is as beloved, saturated, and iconic as Makeshift’s Morale EP.